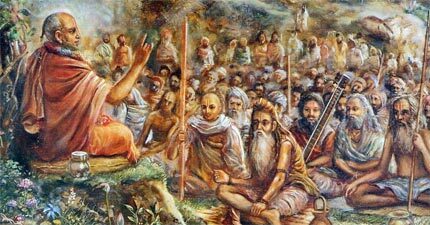 When I tell you that the Naimisharanya meeting of sages some fifty centuries ago is of great importance to us today, you may doubt. After all, the meeting was so long ago and in a forest in India, so you naturally wonder what relevance it could have today. And just who were these sages? A sage, we know, is supposed to be a wise man, one who can answer life’s deepest questions. But so often we see the so- called sage depicted as an impractical, even foolish, old man who receives some ritual respect, smiles benignly, and gives sentimental or cryptic answers to questions from his disciples and admirers. Sometimes such a sage or guru will write books or deliver speeches or attend conferences on the brotherhood of man, world peace, unified religion, and so on. But rarely do intelligent persons consider these quasi- spiritualists and their assemblies and literatures as competent to offer feasible solutions to the world’s problems. And why shouldn’t we question authority? Our authorities exert control over our lives—they have power. And we know how power corrupts. We want to think for ourselves, to decide for ourselves. We believe that our caution and skepticism is a sign of intelligence. I can sympathize with that. I also was trained as a skeptic, a questioner of authority. I suppose it began in college. My philosophy professor prided himself on being what he called a Christian humanist. And he trained and prodded us, his students, to critically analyze all our beliefs and “presuppositions.” I soon learned to put my personal values and goals above all else. Authorities, I concluded, should be followed only as long as they served the interests of the individual. This humanistic approach to life had a profound effect on me, and I became a questioner—cautious and skeptical. This same spirit was there also when I opposed the war in Vietnam. In other words, I questioned all authority, whether religious, political, or whatever. In fact, now that I think about it, my entire generation grew up in this atmosphere: the interests of the individual pitted against the dictates of impersonal social and religious authorities. My sentiments exactly. I felt justified in my rebellion, my questioning of authority—justified in that I wanted complete fulfillment in life, in that I refused to follow any doctrines or rules that restricted my self-actualization, and in that I saw flaws in my authoritarian leaders. I refused, therefore, to surrender my individual integrity to suit such authorities. Now the reason I so rigorously questioned authority—and you’re probably the same way—wasn’t that I was opposed to authority per se, but that I didn’t want to serve another’s interests at the cost of my own. Certainly consulting and following an authority is a convenience we all enjoy. It makes life simpler in many ways, and whenever we’re able to get accurate, authoritative knowledge, we feel we have saved much valuable time. So the idea of authority we already voluntarily accept. It’s the thought of giving up our personal happiness to satisfy the dictates of some authority that goes against our grain. But even that we all accept under certain conditions. For example, when we understand that the restrictions a certain authority places on us are for our best interest, we accept. Such acceptance, we feel, isn’t blind or sentimental; it’s based on knowledge and a clear understanding that, although we may be foregoing some immediate temporary gratification, we are acting in our best interest. For example, we submit to the sometimes painful treatment of a doctor or dentist because we know it’s necessary and in our best interest. Our medical authorities explain to us that although they try to make the surgery or innoculation or whatever as painless as possible, it will still hurt a little; so we have to be tolerant. And the most cautious free- thinkers among us submit to painful medical treatment when we’re convinced it’s for our own good. Consciously or unconsciously, most of us probably apply this same criterion to spiritual authority. We’re willing to sacrifice, we’re willing to submit, we’re willing to undergo difficulties—but we expect first to be convinced logically and rationally that, by our sacrifices and austerities, we’re really serving our best interests. My problem, however, (and you may have experienced the same difficulty) was in finding a spiritual authority that could fully satisfy me intellectually, that could convince me that my best interests would be served if I surrendered. To be sure, I encountered a myriad of religious dogmas and teachers, but I couldn’t accept any of them wholeheartedly. And this is quite common, too, because whenever scriptures or church doctrines are seen as dictating unfair restraints on the individual’s material life, a great humanistic cry goes up. While the conservatives may see contraception and abortion, for example, as immoral and may seek to prohibit them, the humanistic contingent considers the prohibitions themselves to be immoral, because they appear to limit the full expression and realization of the individual’s potential. So who or what is our spiritual authority? Should we doubt our scriptures and church doctrines? And then do we appoint ourselves as the ultimate authority? Certainly that appears to be our tendency, since to alter, interpret, and speculate on authoritative teachings indicates that we hold our own ideas in higher regard than those of the scriptures. But will we, by our own strength, be able to free ourselves from spiritual ignorance? After all, spiritual subject matter—the topics discussed by the Naimisharanya sages and recorded in the Bhagavatam—is beyond our limited field of sensory perception. The spirit soul is described in the Vedic literature as avyakta, invisible. And the supreme spiritual being, the Supreme Personality of Godhead, is described as adhokshaja, beyond the material senses, and acintya, inconceivable by philosophical speculation. Says the Bhagavad-gita: “The Supreme Truth is beyond the power of the material senses to see or to know.” So what spiritual understanding can we expect to arrive at when, by its very nature, spirit is beyond our sensory purview? We may derive some satisfaction from our speculations about God and the soul, but we should know that we’re only guessing. There’s a very wise, commonsensical saying from the Vedic literature: acintyah khalu ye bhava na tams tarkena yojayet. “In matters inconceivable, speculative arguments are useless.” So we require a spiritual authority, just as we require authorities in medicine, law, and every field of education. In fact, the spiritual authority is even more essential than other authorities, due to the esoteric nature of spiritual subject matter. Without following genuine spiritual authority we cannot understand spiritual science. The otherwise unattainable realm of spiritual knowledge comes into focus when we undertake a careful study of Srimad-Bhagavatam.Although I can’t expect to transfer onto you my faith in the authority of the Srimad- Bhagavatam and its pure representatives, I can show you the reasonableness of seeing things as the Naimisharanya sages saw them: in relation with the Absolute Truth. According to the Bhagavatam, the Naimisharanya sages, and all subsequent Vedic authorities in the disciplic line for the past five thousand years, everything is an emanation from the Absolute Truth. Just as light and heat emanate from the sun and spread throughout our solar system, so all existence—from the vast material universe to the innumerable, infinitesimal spiritual souls—has emanated from the Absolute Truth, the Supreme Personality of Godhead. Everything, therefore, is to be understood in relation with the Absolute Truth, the origin of everything. According to this vision, all problems come when things are seen as separate from the Absolute Truth. And, conversely, all problems can be solved when things are understood in their proper perspective in relation with the Absolute Truth. And what is our relation with the Absolute Truth? According to Srimad-Bhagavatam, we are the eternal servants of the Absolute Supreme Personality of Godhead. And how this is so is presented very clearly in the Bhagavatam. The Bhagavatam seeks to teach us three things: 1. We have an eternal relationship with the Supreme Personality of Godhead. 2. We have to perform loving devotional service to the Supreme Personality of Godhead. 3. By so doing, we will solve all the problems of life and attain the highest perfection of pure love of God. The Bhagavatam compares devotional service to watering the root of a tree. When we water the root of a tree, we simultaneously water all the leaves, flowers, and fruits. Similarly, when we serve the Absolute Truth, the Supreme Personality of Godhead, we are automatically fulfilling all other needs and obligations.’ Other attempts at happiness or at combating distress are, therefore, shortsighted. The Bhagavatam explains that although we are eternal spirit souls, eternal servants of the Supreme Personality of Godhead, we have come to this material world to forget our original identity and to engage in activities that have no tinge of loving service to God. This is the cause of all our problems, because to carry out our illusion, we have to take on one material body (and identity) after another, birth after birth. But when we revive our lost, loving relationship with the Supreme Personality of Godhead, we again become rightly situated in our eternal constitutional position. And the Bhagavatam thoroughly explains how this one adjustment is so sweeping as to solve all life’s problems (including the otherwise unsolvable problem of repeated birth and death). And as for solving problems on a global basis—that’s also possible only by putting things in the proper perspective in relation with the Absolute Truth. Materially speaking we find so many nationalities, races, religions, social classes, and so on. But from the absolute perspective, everything has emanated from the Absolute Truth; therefore, everyone is the servant of the Supreme Personality of Godhead and everything is His property. Only when we realize this can we establish real unity and peace—because spiritually we are all equal and we all have the same fundamental need to revive our loving relationship with God. Consider the analogy of the pebbles in the pool. If ten people each throw a pebble into a pool, there will be as many little “self-centered” circles. And the circles will clash and overlap. So, individually, nationally, socially, we all have our selfish, vested interests. And they overlap. But if we could all hit the center of the pool, so to speak, by properly aligning ourselves with the Absolute Truth, the origin of everything, the Supreme Personality of Godhead, then our circles would all be concentric and harmonious. Thus from so many points of view the prescription of the Srimad-Bhagavatam and the Naimisharanya sages is convincing and relevant. And things don’t have to be new to be relevant. Five thousand years ago, the sun that shone down on that Naimisharanya meeting gave off heat and light. And today, the sun is still giving heat and light. The same sun, the same energies, but still relevant. Certainly the Naimisharanya sages, the most elevated and educated persons of that day, considered the discussion of Srimad- Bhagavatam relevant for future generations. Through the eyes of Vedic literature, they were able to foresee that the people of our present age (which began five thousand years ago and will continue for the next 427,000 years) would live “but short lives.” They also foresaw that people would be “quarrelsome, lazy, misguided, unlucky, and, above all, always disturbed.” They took their meeting with utmost seriousness, as they requested Suta Gosvami to explain the essence of the Vedic literature for the benefit of the unfortunate people of this age. So here we are in the 1980’s. The age of quarrel and hypocrisy is in full swing. We doubt and question authority—and for good reasons. But still we are in need of spiritual guidance. Incorrigible free-thinker that I was (and am), I’m very happy to say that I fully accept the authority of the Srimad-Bhagavatam and that, consequently, I accept the authority of the sages of Naimisharanya, as they discuss the ills of our present age and how to cure them. I also accept the authority of my spiritual master, His Divine Grace A.C. Bhakti-vedanta Swami Prabhupada, the founder and spiritual master of the Krishna consciousness movement, who has carefully translated and reasonably explained the Srimad-Bhagavatam for the benefit of everyone. I’m as rigorously philosophical about life as I ever was—I still think for myself—but I know the great value of taking advantage of the best authoritative advice available.